Whatever we experience through our senses is marked by the constant inter-play of opposites, forces of attraction and repulsion or centripetal and centrifugal forces in the external world; or love and hate, or good and evil, in the internal world of our minds. This conflict is particularly marked in the field of religion. 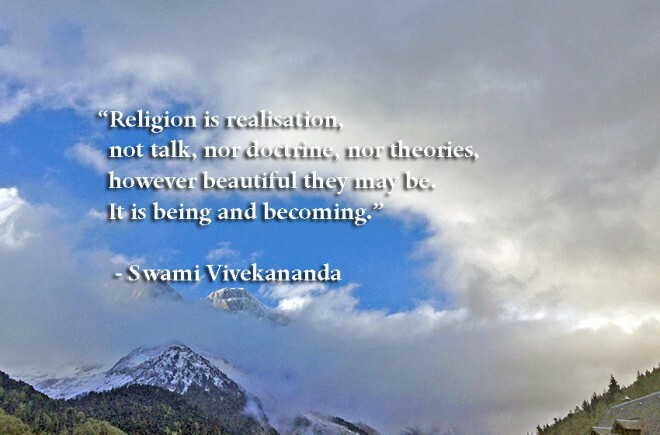 Religion expresses itself at three levels, the philosophical, the mythological or historical, and the ritualistic. Each of these three levels is marked by the same conflict of opposites, often taking positions of violent extremes. The greatest harm comes from the fanatic. We may not doubt the sincerity of the fanatic but often he has the irresponsibility of a lunatic. The fanatic is the greatest enemy of mankind. Given these cleavages, is the idea of the universal religion realistic or just idealistic ? But behind all these differences, we must recognise a deeper level of commonality that suggests that the universal religion already exists, and is constantly evolving and taking clearer shape. No two persons are exactly alike, yet, despite these differences, there is a common thread of humanity. While the human mind and inclination occur in an innumerable variety, four broad types of men may be recognised for practical purposes : the man of action, the man of emotion, the mystic or man of spirit, and the philosopher or man of intellect. Religion must offer a path for each type to follow, suited to the nature of each type. Ancient religion in India offered four such paths, known as Karma Yoga, Bhakti Yoga, Raja Yoga and Jnana Yoga. These paths transform the selfish to the selfless and lead to Yoga or Union or Realisation of the ultimate Truth.